It's 2017. The streets are burning, the ice caps are melting, the hurricanes are bearing down, North Korea is hungry for worldwide nuclear war, and the President is tweeting. Everything might seem hopeless, but we can at least take a measure of comfort in the fact that, when the dust clears, at least the Earth will still be spinning. Or will it? Enter the world of "Flat Earthers." There are some people out there who believe that the world is not a round globe, but a flat disk, with a sheer wall of ice around its circumference, and that there is a worldwide conspiracy keeping the truth from the public. The Flat Earth Society, already a niche group of hobbyists with nothing better to do, was mostly delegitimized during the space race. Astronauts brought home photographic evidence, taken from orbit, which proved the planet's shape. Nevertheless, the anti-science "movement," if one can call it that, has regained steam thanks to the unregulated sea of digital misinformation known as the internet. Anyone with a YouTube account can post conspiracy theories about the true shape of the planet, and a truly disheartening number of celebrities have called into question the undeniable fact that the world is round. Here are 15 Celebrities Who Believe The Earth Is Flat. Science denial has been around since the dawn of science, and the Flat Earth Theory is just another instance of people looking at obvious fact and going, "nah, I know better." One of the most outspoken celebrities leading the charge towards science denial is Kyrie Irving of the Boston Celtics, whose claims about the curvature of the Earth (or supposed lack thereof) made national news, especially when grade-school science teachers claimed that their students were Flat Earthers just because their "hero," Irving, was making those ridiculous claims. When he's not espousing the virtues of the flat Earth or prompting a trade out of Cleveland to step out from the shadow of LeBron James, Irving seems to be fascinated in all sorts of inane conspiracy theories, though he may just be playing for attention. On September 25, the Massachusetts radio show Toucher & Rich reported that Irving was just trolling in some kind of elaborate performance art about how everyone clings to literally every word said by a celebrity athlete. Um... Good prank, bro? If Kyrie Irving is truly done with Flat Earth theory, then the current celebrity flag-bearer for the movement is B.o.B., a pop star rapper who believes 9/11 was an inside job, the moon landing was a hoax, and – of course – the Earth is flat, views which seriously undermine his more relevant stances on social issues such as police brutality and oppression towards black America. B.o.B. 's latest legitimacy-endangering stunt is his recently-launched GoFundMe campaign, called "Show BOB the Curve," which aims to raise funds to purchase satellites to send to space so B.o.B. can have the proof he desires. Unfortunately for him, the campaign has only raised approximately $2400 as of this writing, a far cry from its goal of a cool million bucks. On September 19, LA Times sports reporter Lindsey Thiry tweeted that recent LA Rams transfer Sammy Watkins (who had spent his first three seasons with the Buffalo Bills) was, in fact, a Flat Earther. While no interview footage or audio was released, she said that Watkins himself told her of his bone-headed belief. Why does Watkins think like this, when there is insurmountable scientific evidence proving that the Earth is a globe? After all, that's why globes are globe-shaped. That's why they're called globes! Is it possible that Sammy Watkins believes the whole world exists on a football field? Is he so dedicated to his sport that he is playing the game with every moment of his existence, the way method actors fully commit to a role, even when the cameras aren't rolling? Is Sammy Watkins a method athlete? It all makes sense now. In 2016, Tila Tequila was already a washed-up reality star with no skills, talent, or reasonably likable traits on which to hang her hat. In a Twitter meltdown of legendary proportions, she reasoned that planes would crash if the Earth was actually round and buildings would have a noticeable tilt which would apparently be visible to the naked eye. She then accused Hillary Clinton of having been assassinated and replaced by a clone, and that Tila herself was also a clone. After this sad and desperate cry for attention, she was eventually picked up by the one group sympathetic to her beliefs: Nazis. They must have enjoyed her beyond-the-pale 2013 publicity stunt, in which she posed in front of the infamous Auschwitz concentration camp in disgusting, "Nazi Chic" garb. Following the 2016 presidential election, she was a guest at a white supremacist event, organized by noted Neo Nazi Richard Spencer, celebrating the results of said election. She was promptly kicked off Twitter after posting Nazi rhetoric. In the internet age, any moron with a webcam can become a YouTube celebrity. Eric Dubay is one such opportunist. Dubay has dedicated himself to the proliferation of conspiracy theories, including the Flat Earth Theory. His feature-length film, 200 Proofs Earth Is Not A Spinning Ball, may seem good for a laugh, but there is a menacing undercurrent to Dubay and his beliefs. In addition to his Flat Earth nonsense and other silly diversions like the search for Atlantis and the significance of numerology, he is also a firm believer in the Zionist conspiracy, which has long been a rallying cry of Nazis and the Alt-Right, who claim that people like Hitler were just trying to take back power from secret Jewish cabals. Remember, kids: it's all fun and games until you're suddenly a Nazi sympathizer. Thomas Dolby is a pop music artist best known for his hit single, "She Blinded Me With Science," as well as his distinctly steampunk visual stylings. He is also not a believer in the Flat Earth Theory. However, his album, The Flat Earth, inspired Daniel Shenton to research the topic. Eventually, Shenton reformed the International Flat Earth Society in 2004, after it had all but disappeared years earlier. To thank his unwitting muse for inadvertently opening his eyes to the wide world of science denial, Shenton offered Thomas Dolby prominent placement in the Society. Flattered by the invitation, Dolby accepted, and is officially Member #00001 of the International Flat Earth Society. In this case, it's safe to say that Thomas Dolby was blinded by pseudo-science. If someone says, "I'm not a racist, but...," then you rest assured, they're almost certainly racist. In this case, professional wrestler AJ Styles says, "I'm not a Flat Earther, but..."
The erstwhile "Mr. TNA" wouldn't fully explain his position, but, in a February appearance on Talking Smack, he got into it with GM Daniel Bryan, saying, "I'm not a Flat Earther. I'm just saying there's some things about it that make sense. I don't think you can handle it." In a subsequent appearance on a wrestling-themed podcast, Styles continued, suggesting that the amount of money going into NASA could be influencing their decisions. Through it all, he fell back on the weak defense of, "I'm a sci-fi guy." So, basically, AJ Styles doesn't believe the Earth is flat, just that it would make sense if it was, and he has more knowledge, but he doesn't think other people "can handle it." Flat Earthers often point to famous playwright George Bernard Shaw as their most revered advocate. However, this is a lie based on selective manipulation of actual information. The quote often used to affirm their belief is one which appears to validate their claims that science is not to be trusted: "...We believe [the Earth] to be round, not because [we] could give the physical reasons for so quaint a belief, but because modern science has convinced us that nothing that is obvious is true, and that everything that is magical, improbable, extraordinary, gigantic, microscopic, heartless, or outrageous is scientific." Of course, the Flat Earthers usually leave off the follow-up sentence: "I must not, by the way, be taken as implying that the Earth is flat, or that all or any of our amazing credulities are delusions or impostures." Shaw is saying that just because science is complicated beyond the reasonable understanding of most average people, that doesn't mean that science is something to be dismissed or disavowed. "I'm not saying I think it's flat or round. I don't know, but it could be." Such were the words of Draymond Green of the defending NBA champion Golden State Warriors. This type of passive mistrust of scientific fact is a key component of most conspiracy theories. Green says he doesn't know for sure. Sure, there's science which supports this to an extreme degree, but he's never personally been to outer space to see it for himself, so who knows? Green countered the scientific evidence regarding the Earth's shape with his own form of science (or something like it), his iPhone. "I can make a round picture with my iPhone today on a panoramic picture and make it look round." What response is even possible to nonsensical logic like that? Is he just trolling? To what end? Maybe Draymond just really wants to go to outer space. If so, he should donate to B.o.B. 's GoFundMe project. Maybe he can hitch a ride on one of the satellites. Kay Burns is not a Flat Earther. However, like Hank Williams (Luke the Drifter) and Beyoncè (Sasha Fierce), Kay has an alter ego. Kay is actually a multidisciplinary performance artist, and her character, Iris Taylor, is a Flat Earther. In fact, Iris is the driving force behind the Flat Earth Society of Canada, which raises an obvious question: why does Canada have its own Flat Earth Society? Anyway, performance art can be fun, but is it just a performance if one is preaching to the Flat Earth crowd who doesn't realize (or care) that they're part of a joke? Is Kay/Iris doing more harm than good? Is there entertainment value in poking fun at people who enable those who would deny science and substitute dangerous conspiracies instead? See, this is why performance artists, like method actors, annoy people. For a brief moment in March, everybody thought that the great Shaquille O'Neal had consumed the Flat Earth Kool Aid and succumbed to the blissful ignorance of science denial. Fortunately for the nation's collective sanity, Shaq later elaborated on his position, saying, "The Earth is flat. Would you like to hear my theory? The first part of the theory is, I’m joking, you idiots!" Phew, crisis averted. He went on to explain that, to the naked eye, yes, the Earth looks flat. However, science has proven that the planet is round, and that, as they say, is that. Case closed, end of story. Shaq is smart enough to know that science is smarter than him, than Kylie Irving, than Tila Tequila, and, indeed, smarter than even Sherri Shepard. As a co-host on ABC's The View, Sherri Shepherd built something of an infamous reputation for... Well, for saying some really silly things, such as, "I don't think anything predated Christians," and referring to Shirley Caesar as "the black Patti LaBelle." Everybody knows that Patti LaBelle is black. It's not fair that she, of all people, got to get all up on Prince. Still, perhaps her most infamous gaffe came in 2007, when, just after denying the Theory of Evolution, she appeared to suggest that the Earth was flat, or, at the very least, that she didn't know one way or the other. Years later, when B.o.B. started spouting his own Flat Earth nonsense, Sherri clarified her position, explaining that she was merely nervous (as the incident occurred during her first week as co-host) and that she fully acknowledges the scientific fact that the Earth is round. 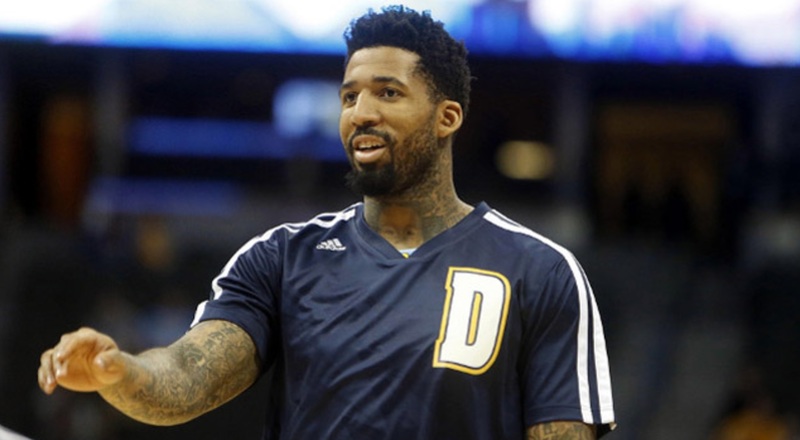 Next up, there's Wilson Chandler, yet another NBA player who refuses to acknowledge science. "Just walk outside and use your five senses," said the Denver Nuggets star, who has no interest in accepting that the world is bigger than he is. And he's only 6' 8"; by the exceptional standards of the NBA, he's not even that big. Maybe the issue here is that NBA players just can't understand that there's a whole world out there, off the court. And, obviously, this is not to say that all, or even most, NBA stars should be punished for thinking stupid things. In his rebuttal against Kyrie Irving, astrophysicist Neil deGrasse Tyson (generally recognized as a smart person) was relatively even-handed, saying that Irving could believe what he wanted, "...As long as he continues to play basketball and not become head of any space agencies." Okay, seriously, what is it with these sports guys and the Flat Earth Theory? Even Stefon Diggs of the Minnesota Vikings came out in support of Kyrie Irving's outlandish claim. However, now is when the true test begins. Irving has (seemingly) finally come out and proclaimed that he was trolling the world with his little prank, which was neither little, nor amusing, nor harmless. Now that he has thrown in the towel, so to speak, will the rest of his athletic supporters follow suit? Will Stef Diggs and Wilson Chandler and the rest of them come clean as well? Or will they double down and stand by their supposed belief that the Earth is flat, the way some people stand by their belief that global warming is a hoax in spite of veritable mountains of evidence to the contrary? Will it be easier for them to just plug their ears and shout their meritless opinion while ignoring simple scientific fact? Time will tell. Diggs is having a really solid fantasy season so far, though. So there's that. Every organization has a leader, and for the International Flat Earth Society, that leader is Daniel Shenton, who rarely poses for pictures without having his arms stretched out like The Vitruvian Man's younger, dumber brother. As mentioned earlier, Shenton was inspired by Thomas Dolby's album, The Flat Earth, even though Dolby is not actually a Flat Earther himself. Still, that didn't stop Shenton from reviving the International Flat Earth Society, a group dedicated to using the illusion of integrity to enable those who would discard scientifically proven facts which get in the way of whatever narrative they may be attempting to push forward. The Earth is round. Deal with it. It is not an "alternative fact" that the Earth is flat. The only alternative to facts are lies. Flat Earthers are not about alternative ways of thinking; they're only here to allow for alternatives to thinking. What do you think? Is the Earth round? Or is it flat? It's definitely round, but feel free to leave a comment, though.